Bathrooms - Historically they were small, out of the way and unconsidered but today bathroom renovations in Winnipeg have moved to entirely new levels of splendor. The options for your new bathroom renovation are endless. Today it's not just about a sink, toilet and bathtub. No, today you can have it all, starting with bidet toilet in any color under the sun complete with an electronic lid and heated toilet seat. Why have a traditional sink when you can have his and hers vanities with adjustable overhead lighting and the floor under your feet is heated. Your shower is now a steam shower with adjustable color lighting and aroma therapy and it wouldn't be complete without an ipod doc so you can listen to your favorite tunes as you relax in your dreamy steamy shower. Top it off with a whirlpool tub and adjustable flame and color fireplace and now you've got a bathroom fit for today's discerning homeowner. Harwood does everything with a touch of class and their bathroom renovations are anything but ordinary! 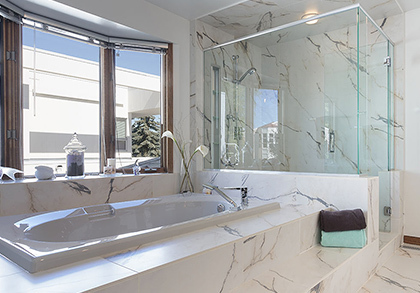 View our gallery to see some great bathroom renovations. "On behalf of Linda and my family, I'm writing at this time to express our sincere thanks and appreciation for the outstanding work you and your team did on our house. We couldn't be happier. The final result is nothing short of world class and has exceeded our expectations. Your crew is first rate. The care and attention to detail was impressive to say the very least. We felt nothing but comfort and confidence having them all in our home. Punctual, caring and beyond considerate. I also noticed how much respect they have for each other and for the company. There is a lot of pride there and I can see why you have such a loyal and dedicated bunch. I also personally appreciated the interaction I had on a daily basis as I lived in the house throughout. So much time was taken to show me what was going on and explaining every detail. I learned a lot. Thanks again for everything Wayne. This was a long process. You hung in there with us all the way. You've got some big fans over here! Harwood will get nothing but positve and enthusiastic recommendation."